In the past, when releasing a new version of one of my projects, I would write up a long announcement and post links on social media. It would get retweeted and shared, and that was basically all of the promotion that I did. After that, I’d go silent for a few months as I started working on the next version of my project. I’ve always wanted my projects to be more active on social media, though. I knew that more content would keep people excited about the project while I was hard at work coding. Maybe an extra 3-4 posts after a new release to help promote it for a longer period of time. It would give folks a second (or third) chance to see that I’ve released a new version, in case they missed the original announcement. It would also create more opportunities for people to retweet/share some posts and attract the attention of more potential new users. Time commitment is something to keep in mind, though. I’d love to write up a ton of really in-depth blog posts and record some educational screencasts for my projects. Those are both certainly good resources to have available for my users, but they’re also just as much work as writing code. I don’t think I can do three or four of those between releases without committing to several days of work. Ideally, I could generate enough interesting social media content for a new release in a day or less. Recently, I came up with something so simple that it probably should have been obvious in hindsight. When I’m putting the finishing touches on a new version of a project, I pull out some screen recording software and create 3-5 animated GIFs of the new features in action. They don’t need to be longer than several seconds, so they’re super easy to make. In fact, sometimes only a screenshot is all that’s needed. I can make these GIFs all at once, and then post one every week for a few weeks following a release. When I first thought of using these animated GIFs, I went back and forth in my head whether it was a good idea or not. I personally get annoyed when a product’s social media account shares the exact same content, like a blog post, more than once. I follow about 75 people/products on Twitter, and that means I can read every single tweet in my timeline. Basically, I force myself to create a feed that is always filled with interesting content. If an account tweets too often, or if they duplicate the same links over and over again, I’m wasting my time on too much noise, and they get unfollowed. That’s my metric for figuring out how my project’s social media accounts should “behave”. It came down to this: The original announcement of my project’s new version is basically a list of cool, new features all mashed together into 140 characters or less. I might include one image to highlight something particularly cool, but I can’t cover everything in detail using one tweet. The animated GIFs make good followup posts because they can focus on showing off one, individual feature in more detail. That adds value beyond the original post, which is exactly what I want. What other easy ways are there to promote a project on social media without a big time commitment? In the past, I’ve shared previews of new features when they’re still in development and not quite finished yet. That can be exciting for users, but it can also take away some of the impact when those features are finally released at a later date. It’s always good to see a cool app that someone built with one of my open source libraries. That’s an obvious thing to share with my followers, of course. However, most developers don’t go out of the way to show me their projects that use my code, and if they did the work for an employer, they might not be allowed to share. That means I can’t necessarily make this type of post very consistently. Those are a couple of types of content that I like to share when I can, but do you have any other ideas? A couple of weeks ago, I posted about how I’m porting a Flex app to JS/HTML/CSS. It’s a pretty complex app that I’ve been working on for a number of years, and it’s sure to require many months to complete. I know that I’ll learn a lot in the process, and I hope to share what I can. 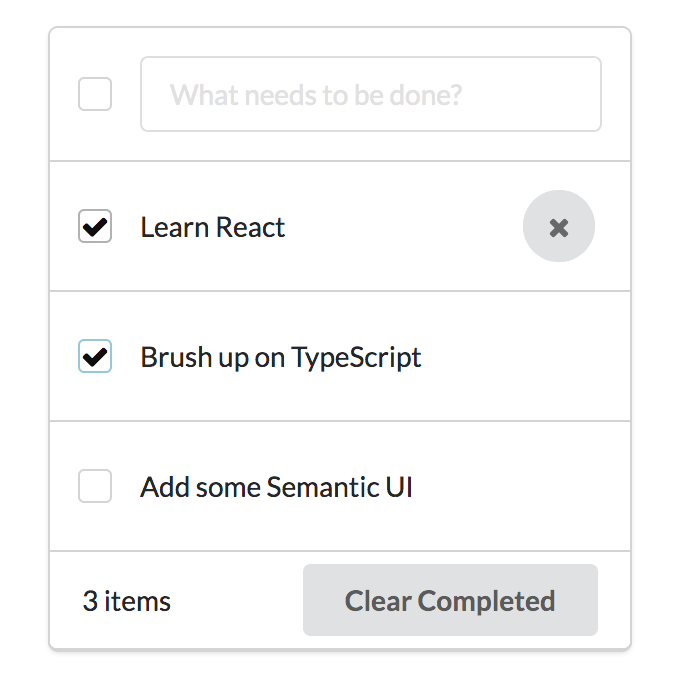 Right now, it looks like my technology stack will be mainly React, TypeScript, and Semantic UI. Obviously, I’m sure to eventually pull in some additional libraries, like React Router for URL routing, but those first three are the basic foundation. I recently created a semantic-ui-react-typescript-examples repository on Github. I wanted a place to store some of the smaller scale UI prototypes that I’m building while I figure everything out. I won’t go into detail about every example here, but let’s take a moment to look at the Todos example. This one, in particular, shows many of the things that you’d expect to find in a framework/library that you’re evaluating when porting a Flex app. It displays data in a list, and items can be dynamically added and removed from the data provider. The items in the list are rendered with a custom component, similar to how lists in Flex support custom item renderers. The number of items is displayed as text, and it gets updated dynamically. This is similar to Flex’s data binding feature. Right now, you’ll find five examples in this repository. Mostly I’ve been trying out some layouts, but my most recent example hooks up React Router to some tabs to support browser history with the back button. I still have a lot to explore, so I’m sure that I’ll be filling this repository with more examples in the future.